But both sides in the Portland case are watching a nearly identical Massachusetts case before the U.S. Supreme Court. A federal judge considering whether to lift a Portland ordinance prohibiting anti-abortion protests around the entrance to a Planned Parenthood clinic said Thursday that until the U.S. Supreme Court rules on a related case she must rely on existing law that allows similar buffer zones. Lawyers on both sides of the issue had said they anticipated the high court might rule Thursday morning, prior to a scheduled hearing on the Portland law in U.S. District Court in Portland. A pedestrian walks past anti-abortion protesters on Congress Street in Portland near the Planned Parenthood clinic in this Oct. 4, 2013, photo. But the Supreme Court did not rule on the nearly identical Massachusetts case and has yet to say when it will do so. The Supreme Court has about a dozen cases to decide before its annual term ends in two weeks. The Massachusetts case concerns whether the state can enforce a 35-foot, no-protest buffer zone around the doors of abortion clinics, or whether that violates the First Amendment rights of protesters hoping to persuade pregnant women against ending their pregnancies. The Portland ordinance established a 39-foot buffer zone around the Planned Parenthood entrance on Congress Street. Judge Nancy Torresen told lawyers in the Portland case that the most recent ruling by the 1st Circuit Court of Appeals in Boston allows the Massachusetts buffer zones. In the Maine case, Daniel and Marguerite Fitzgerald of Shapleigh and their children sued the city of Portland, Mayor Michael Brennan and each member of the City Council after the Portland ordinance was enacted last November. Their attorney, Erin Kuenzig of the Thomas More Law Center in Michigan, argued Thursday that the Portland buffer zone should be lifted until their lawsuit is decided. The Fitzgeralds claim that the buffer zone violates the First and Fourth amendments of the U.S. Constitution, which protect free speech and prohibit unlawful search and seizure. They were joined in the case in March by another anti-abortion protester, Richmond resident Leslie Sneddon. Torresen made no immediate ruling on the Fitzgeralds’ and Sneddon’s motion to temporarily suspend the city ordinance. She said she will visit the Planned Parenthood site at 443 Congress St. as she considers the motion. Kuenzig argued that despite the similarities between the Massachusetts case and the Portland case, there are key differences. In Massachusetts, she said, police were unable to control large crowds that congregated outside of abortion clinics and that violent crimes had occurred there. Kuenzig said that police in Portland had not charged any of the protesters with a crime and argued that activities here had been peaceful. The judge asked Kuenzig how she would define the difference between peaceful and criminal behavior by protesters. Kuenzig argued that those comments were presented to the City Council by Planned Parenthood. The city’s attorney, Patricia McAllister, argued that the City Council specifically passed a 39-foot buffer zone because the Planned Parenthood facility is in the center of the city, accessible only by public sidewalks and that police lack the resources to stand guard outside. McAllister said that protests of all sorts occur almost every day across the street from the clinic in Monument Square, and that the anti-abortion protesters can spread their message from there, including holding signs and praying. “What they really want is to be able to closely approach anyone, including unwilling patients,” McAllister said. She said 97 percent of all Planned Parenthood patients who were surveyed said they felt intimidated or harassed by anti-abortion protesters. 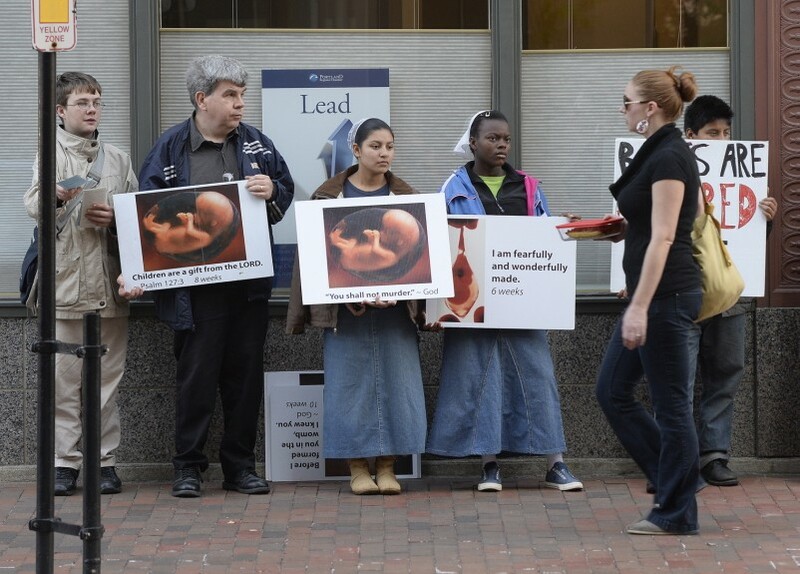 For about a year before the Portland ordinance was enacted, 10 to 25 anti-abortion protesters, including children, gathered regularly in front of Planned Parenthood’s entrance, some holding large signs with graphic photos of aborted fetuses. Some shouted Bible verses at women and called them murderers. Soon after the protests started, Planned Parenthood hired police officers to ensure the protests did not get out of control. The clinic also had volunteers in brightly colored vests who helped patients navigate the crowd. Portland Police Chief Michael Sauschuck said in a sworn statement filed in federal court that although no one was cited for criminal or civil offenses during the protests, he supported the buffer zone ordinance. “Just because certain behaviors might not rise to the level of criminal harassment, that does not mean a person having to transit a ‘gauntlet’ of protesters while entering the clinic might not legitimately feel harassed and intimidated,” he wrote.